Hero Nara Rohith has always come up with experimental roles irrespective of the results. Now, he is getting ready to essay another challenging role. He will be playing a speech impaired person in his next film. 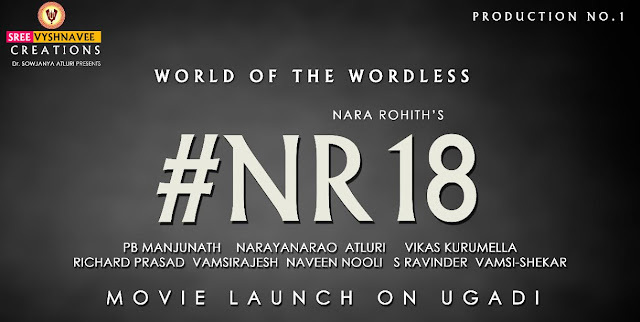 It will be eighteenth film of Nara Rohith. Formal launch of the film will be held on the auspicious day of Ugadi. The untitled film will be helmed by PB Manjunath and produced by Narayana Rao Atluri under Sree Vyshnavee Creations banner. Story & dialogues are penned by VamsiRajesh. Music will be composed by Vikas Kurumella and cinematography is by Richard Prasad of 'Swamy Ra Ra' fame. Further details will be announced later.